Order items from Amazon using the AmazonSmile program. Amazon will donate 0.5% of the price of your eligible AmazonSmile purchases to the Children’s Hemiplegia and Stroke Association. This is a donation from Amazon.com and you will not pay any extra fees. Click here to enter AmazonSmile program and raise funds for CHASA. Bookmark this page and share the link with your friends. 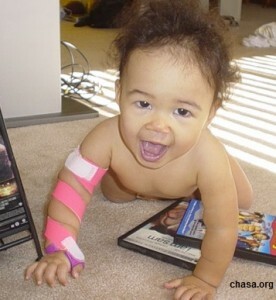 Help CHASA keep Helping Kids with Hemiplegia and Pediatric Stroke! A number of items, including gift cards, may be eligible for the donation program, so feel free to keep shopping throughout the site. Amazon will track the items you’ve ordered and send the donation to CHASA. CHASA is a 501(c)(3) nonprofit organization serving children with hemiplegic cerebral palsy, pediatric stroke, and paralysis. CHASA helps these kids by providing orthotics (hand and food braces) for kids in need, college and trade school scholarships, adaptive sports scholarships, an annual family retreat, local support groups and many other programs designed to help these little stroke survivors become happy and successful adults.